Businesses worldwide are in an arms race of sorts, bringing in new technologies, and using data to innovate and spur growth. But amid all this noise and excitement – with companies becoming increasingly reliant on cyber capabilities – the danger level is rising. There is growing recognition among C-level executives that their use of automated systems could leave them more vulnerable to operational disruption and data compromise. Bad actors abound, and they’re getting better and better at what they do. Many are now employing AI in their “work.” For the average company, that means the bar is rising higher on what constitutes good security, and what is required of companies who want to avoid being hacked. Hackers are growing in sophistication, with some of them even distributing their malware payloads via file sharing. 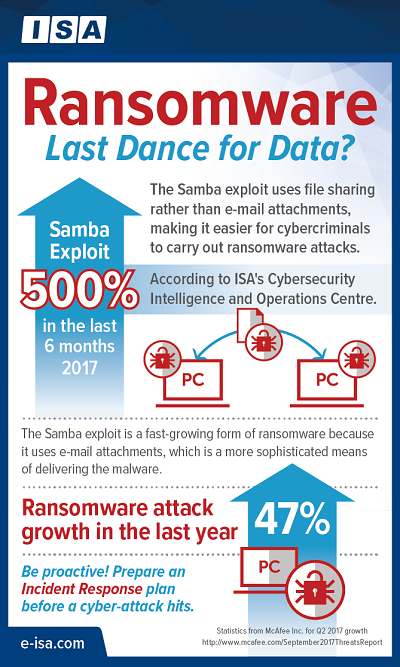 According to network data gathered by ISA, there was a 500 per cent increase in a file sharing exploit known as Samba, between Q2 and Q4 2017. Companies are in tough against a resourceful enemy, and can not afford to take a passive approach to security. To help companies tackle their cyber attacks in hours rather than days, ISA recently launched an Incident Response Readiness Service that allows organizations to establish the terms and conditions for incident response before a cyber attack is suspected. The service, which supplements ISA’s longstanding incident response service, provides an initial triage within 30 minutes of an attack — 24 hours a day, seven days a week — through access to its CIOC. Without the service, companies can take days or even weeks to recover from a breach as opposed to hours — roughly the difference between inconvenience and catastrophe. Customers can customize the offering to include proactive steps that minimize their cyber security risk and improve their overall security posture. Visit ISA to find out more.